Game Description My attempt to create a demoscene-style intro for AGI, the first of its kind. It's not very impressive as intros go, but it's not bad considering the severe limitations that AGI has. There's a very short scroller in the bottom prompt area and two independently moving animated logos (one of which is larger than the maximum sprite size), along with looping background music. 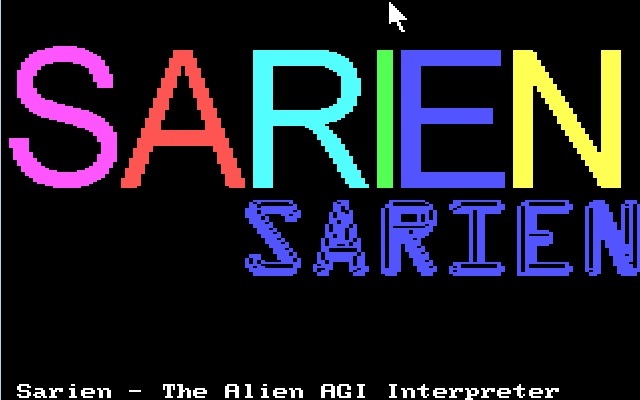 The only theme I could think of was promoting the Sarien interpreter mentioned above, which is somewhat ironic since it exposed several previously unknown bugs in Sarien which had to be fixed before it would work right. The music is classical instead of the usual demo music because I couldn't find any in MIDI format.